At an idyllic location, by Santa Maria beach, White Dunes Cycladic suites provide some of the most sophisticated and luxury accommodation in Paros. Suites guests can enjoy the most tasteful breakfast in one of the most beautiful suites in Paros with a magnificent sea view, swim in the crystal clear waters of the swimming pool, have a refreshing cocktail in the snack bar by the swimming pool, but also fully relax with a revitalizing massage. 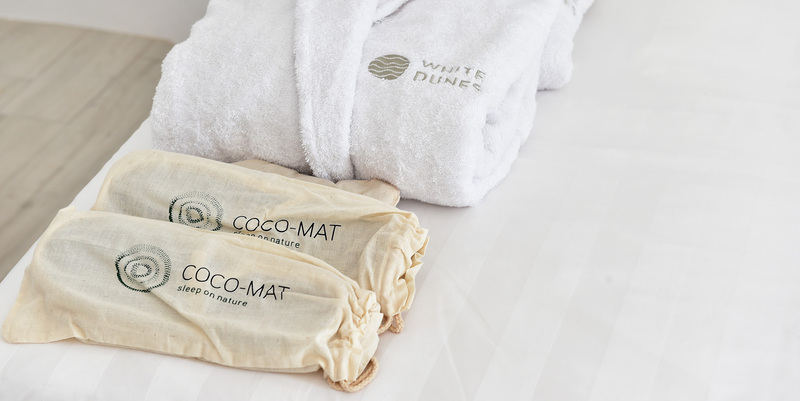 Ideal for both couples and families with little children, White Dunes offers a wide variety of services and facilities, thus covering the needs and wishes of even the most demanding travelers. The sunny swimming pool and the playground for our younger guests, the wide variety of breathtaking activities, trips and aqua sports as well as the cruise proposals, make White Dunes amazing for younger and older guests. Therefore, anyone who wish to enjoy their holidays in a modern and comfortable room in Paros, should just choose White Dunes family hotel for their stay in the Cyclades or even experience the happiest day of their lives by organizing a really fairy-tale wedding reception in Paros.